Trilogy Brands bets China has an appetite for American brands. From a number of heavyweight speakers from home and abroad to share new ideas, new online and new channel integration, new technology innovation applications, shopping center transformation and upgrading of the industry hot topics, while the attention of the roundtable forum guests from different angles around brand value, to expand the challenges and opportunities in the Chinese market, retail brand tenants and owners of the win-win cooperation, and shopping center successful business model and other key topics in-depth discussion. Speakers included: Jack Rennes, Executive Director of Hang Yung Real Estate Co., Ltd. Chen Wenbo, Co-President of Metro Holdings Group Co., Ltd., Barbara D'amato, CEO of Trilogy Brands Group, Chief Executive Officer of Burger King China Investment Co., Ltd. James Hawkey, Senior Director, Jones Lang LaSalle & China Retail Director Lin Jirui, Vice President of Baodong Real Estate Holdings Limited and General Manager of Baolong Commercial Real Estate Pan Lijun Tom McGee, President and Chief Executive Officer, ICSC International Shopping Center, Wal-Mart, Senior Vice President, Real Estate Development, Wal-Mart, Chairman of Wanda Network Technology Group Qu Dijun, Vice Chairman of Chia Tai Group Luo Jia-shun, Nan Fung Group Zhongnan Joint Asset Management Limited Wang Yuansheng, Managing Director of Wanda Business Management Group Shanghai Region Wang Qingsheng, Executive Director of Dingshi Business Group Wang Wei, President of Shanghai Miaojiaofang Food Co., Ltd. Wang Zhigang, Assistant President of Zhongliang Holding Group and Commercial Real Estate Wu Di group president, deputy general manager of the theater group Seohyun earth and long. 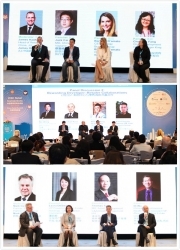 The summit took place in Shanghai, the most vibrant and growing retail economy in China and the city with highest population growth in Asia Pacific. As technology and demographic shifts occur at an accelerated pace, the Asia Pacific retail landscape is rapidly evolving. Consumers, particularly the growing millennial population which is shaping the future consumption market, are placing a high priority on experiences and convenience. Behaviors and expectations are not as easily predicted as was the case in the past. The leading shopping center owner/developers, retailers and industry leaders in the Asia Pacific region gathered at this event to address the numerous issues critical to the industry: Innovative retail concepts, effective customer-engagement strategies, seamless customer experiences, the strength of brands, and the increasing role of food and beverage in retail; and to network, discuss opportunities, and recognize industry’s best practices and innovation.